Thanks to your feedback, Swimia has grow to be in just many months one the most important web-sites of swimming pools. Here you have got all the info we know about Pincher Creek Multi-Purpose Facility, in Pincher Creek. 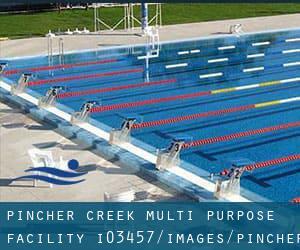 Don't forget you can also promote this pool so Pincher Creek Multi-Purpose Facility will appear the first of Pincher Creek, or even the very first of your country, contact us to know more. Ever been in Pincher Creek? Updated on 2019 Among all the activities offered by the centre, for anyone who is considering swimming you can enjoy 17 meters, Salt Water, Indoors. If you need to contact this Swimming Pool, email address and phone number are both number. Updated on 2019 Swimmers like you reported 25 meters, 3 lanes, Indoors. Unfortunately we do not have the email address of this Swimming Pool, but we can provide you with the phone number. Updated on 2019 228 - 12 Avenue S.E. , High River , AB , CANADA (Postal Code: T1V). This sports centre offers 25 meters, 6 lanes, Salt Water, Indoors. For this Pool, only phone number is number here. Updated on 2019 5600-44 Ave. , Rudy Swanson Park , Camrose , AB , CANADA. This sports centre delivers 25 meters, 6 lanes, Indoors. Contact information for this Swimming Pool just like phone number and email address are number. Updated on 2019 #10 Knowledge Way , Grand Prairie , AB , CANADA (Postal Code: T8W 2V9). Swimmers like you have reported Olympic size, 10 lanes, Indoors. Also, you will find 25 meters, Indoors. Just in case you need to contact this Swimming Pool before dropping by, we only know the phone number. Updated on 2019 1900 - 8th Avenue , Canmore , AB , CANADA (Postal Code: T1W 1Y2). Among all the activities offered by the centre, in case you are considering swimming you will get pleasure from 25 meters, 4 lanes, Indoors. Just in case you want to contact this Swimming Pool before dropping by, we only know the phone number. Updated on 2019 405 Spray Avenue , Banff , AB , CANADA (Postal Code: T0L 0C0). Swimmers like you have reported 32 meters, 2 lanes, Salt Water, Indoors. Also, you will find 20 meters, Salt Water, Outdoors. Just in case you want to contact this Pool just before dropping by, we only know the phone number. Updated on 2019 7121 - 178 Street N.W. , Southwest , Edmonton , AB , CANADA (Postal Code: T5T 5T9). This sports centre delivers 25 meters, 6 lanes, 1 meters - 2.4 meters depth, 1 meters - 2.4 meters depth, Indoors. For this Swimming Pool, only phone number is number here. Updated on 2019 4514 - 50 Avenue , Wetaskiwin , AB , CANADA (Postal Code: T9A 2Z5). Among all the activities offered by the centre, if you are considering swimming you may enjoy 25 meters x 15 meters, 6 lanes, 1.2 meters - 3.7 meters depth, 1.2 meters - 3.7 meters depth, Indoors. If you should make contact with this Swimming Pool, email address and phone number are both number. Updated on 2019 11510 - 153 Avenue, N.W. , Castle Downs , Edmonton , AB , CANADA (Postal Code: T5X 6A3). Among all of the activities supplied by the centre, in case you are interested in swimming you may appreciate 25 meters, 6 lanes, 1 meters - 3 meters depth, 1 meters - 3 meters depth, Indoors. Just in case you need to make contact with this Swimming Pool before dropping by, we only know the phone number. Updated on 2019 1975 - 111 Street, N.W. , South Central , Edmonton , AB , CANADA (Postal Code: T6J 7C6). Among all the activities offered by the centre, if you are interested in swimming you might take pleasure in 25 meters, 6 lanes, 1 meters - 2.5 meters depth, 1 meters - 2.5 meters depth, Indoors. Just in case you desire to contact this Swimming Pool before dropping by, we only know the phone number.